Hey guys! So my plan was to have one of these Well Dressed Guide posts up every Tuesday. I knew J.Crew Factory new arrivals were coming into store on Monday, so I thought perfect I can have the post all ready to go for Tuesday. But the new arrivals didn't come online until yesterday, so I had to wait until today to share. But there are some super cute new things, I don't want you all to miss out on! I'll be honest I've been totally annoyed with J.Crew Factory for all the ruffle sleeves, but when I saw this green top I knew I had to have it. It is so cute on, plus I love the green color. It's my only purchase so far from the new arrivals, though I fully expect a few more. The other thing that initially stood out to me was the metallic polka dot sweater, it is a fun pattern and in my favorite Teddie style. I can't wait to wear it with a maroon puffer vest, I think that would be super cute. 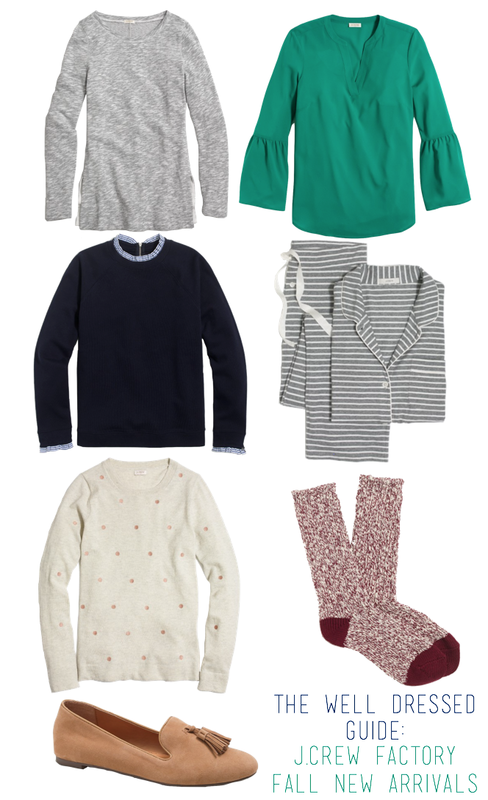 Also, J.Crew has really been appealing to my college self with some super cute sweatshirts. I think the gray one would be great for pairing with leggings and a puffer vest and who can resist the adorable ruffles on that navy sweatshirt? If you know me, you know I love pajama sets, so that super cute gray stripe one is definitely something I'll be wanting to pick-up. And we all need a new fun colored pair of camp socks for fall and winter. The loafers are something I'm on the fence about, I think they are super cute but I'm not sure how much I would wear them. J.Crew Factory has been killing the shoe game lately. Have you shopped J.Crew Factory's new arrivals, if so what's your favorite? I just wanted to say this because I feel like I am constantly gushing about J.Crew Factory, I am not at all sponsored by them or influenced by my employment there to talk about there products. I just genuinely love their clothes and they are what I wear pretty much all the time!